When my client started swiping guests’ credit cards at registration, the valet helped them market the change. Anyone who has followed my trainings on how to properly conduct a benefit auction registration and checkout process knows my analogy of the hotel versus the grocery store. 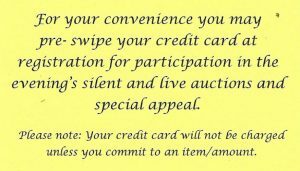 At your benefit auction, it’s best to function like a hotel, swiping each guest’s credit card before letting them enter your property (i.e. the silent auction). Operating like a hotel means that your charity auction team must use credit card terminals designed for an auction environment. Once those terminals are rented and ready for use, you need to then consider how you’ll prepare your charity auction guests for this change in payment procedures. After all, you’re now asking a guest to give you his credit card before he decides to buy an item or donate to your cause. To pave the way to greater acceptance, one client asked the valet to hand each guest one of these cards when he took the keys. Guests would read it en route to the check-in table and were “softened” to the idea of handing over their credit card. 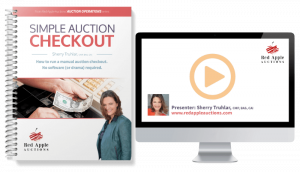 Are you struggling with charity auction checkout procedures? Simple Auction Checkout is all you will need to make registration and checkout a snap. I encourage my own onsite clients to review this process annually to ensure it runs without a hitch. Registration and checkout is not hard, but running it does require an understanding of the steps.